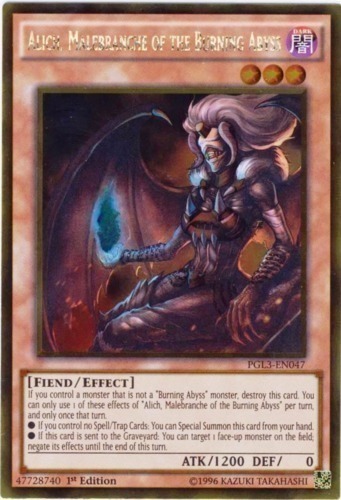 Text If you control a monster that is not a "Burning Abyss" monster, destroy this card. You can only use 1 of these effects of "Alich, Malebranche of the Burning Abyss" per turn, and only once that turn. ● If this card is sent to the Graveyard: You can target 1 face-up monster on the field; negate its effects until the end of this turn.